Bill DeLord Buick GMC is your one-stop shop for new, used and Certified Pre-Owned GMC trucks and SUVs. Visit our dealership in Lebanon, Ohio, conveniently located near Cincinnati, Dayton, Springsboro, Middletown, Mason and Centerville, and browse our impressive selections of new and used GMCs. Looking for the best GMC for sale? Visit our GMC Specials page to get exclusive offers for even more savings on a Bill DeLord Buick GMC. From pickups like the Canyon and Sierra to our line of SUVs boasting the Terrain, Acadia, Yukon, we truly have something for everyone. No matter what your needs are, commercial or personal, if you need a truck or SUV, we’ve got you covered at Bill DeLord GMC. Stop by and ask our expert employees about any vehicle and they’ll be happy to take you on a test drive and answer all your questions. In fact, 5-star customer service is paramount at Bill DeLord GMC. 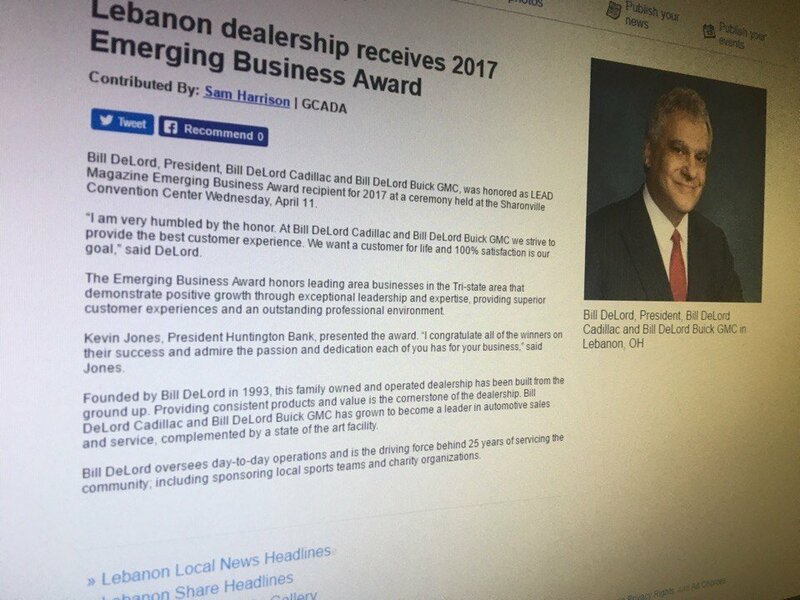 The recipient of the 2017 Emerging Business Award from Lead Magazine, Bill DeLord has been recognized for his commitment to inspiring leadership and expertise. That commitment has been reflected in the customer-first atmosphere at Bill DeLord GMC. Join our happy GMC client family! The Bill DeLord experience continues on after the point of sale. In fact, it’s just beginning. The state of the art service center at Bill DeLord Buick GMC for Dayton and Cincinnati car shoppers is the best, swiftest and most efficient way of ensuring your GMC stays on the road, looking like it just came off the factory line. That’s because each one of our technicians has been trained specifically to work on GMC vehicles, new, used, or Certified Pre-Owned. With genuine OEM parts, our technicians are always well equipped to give your vehicle the best and most effective service possible. If you’re coming in for an oil change, filter replacement, tire rotation, transmission, engine, or alternator repair or even a battery replacement, we give every car the same kind of care we would give our own. Because it is our own, after all. And we always offer complimentary car washes after repairing your GMC and courtesy transportation for the duration of the work. Not to be overlooked is our financing department, that will leverage our longstanding relationship with the areas top lending institutions for your benefit! At Bill DeLord Buick GMC, we know that owning a vehicle is a necessity, not a luxury, which is why we make sure we always get you the best purchase or lease deal on all of our available GMCs. But don’t wait for us! You can go ahead and get started yourself by using our Online Monthly Payment Calculator to approximate what kind of monthly payment you would have with every car you’re interested in. You can also get an idea of what your trade-in is valued at, and the beautiful thing is you can do it all from the comfort of your house. You can even apply for financing online conveniently through our website or just drive from the Cincinnati or Dayton area to talk to our finance team in person! At Bill DeLord Buick GMC we’re always here for you, but we also want you to have the ability to do as much from home as you’d like. We’re looking forward to hearing from you!